One Year Anniversary and a BLT Salad! I can’t believe it’s been a year. 12 months. 52 weeks. 365 days. 8,760 hours. It is by far the longest commitment I have ever made to something I am not required to do. What a ride it has been. I’ve met incredible people – farmers, artisans, bloggers – along the way. I’ve done things I never thought I would (yeah…like that whole stuffing forcemeat into a beef bung kinda thing). We’ve gone on some amazing epicurean adventures, you and me. And I hope that it will continue for a long, long time. I’m feeling good about this next year – it’s going to be a fresh start. I’m going to take some time out to focus on reflection. We are moving out of our house into a new place. And my term as National President of Beta Chi Theta Fraternity finished last week. I look forward to the new challenges and opportunities the next few months will bring. And even though there exists a bit of ambiguity, I know that regardless of everything, I’ll be eating well. It’s the most beautiful time of the year where produce is bountiful and everything just tastes amazing. 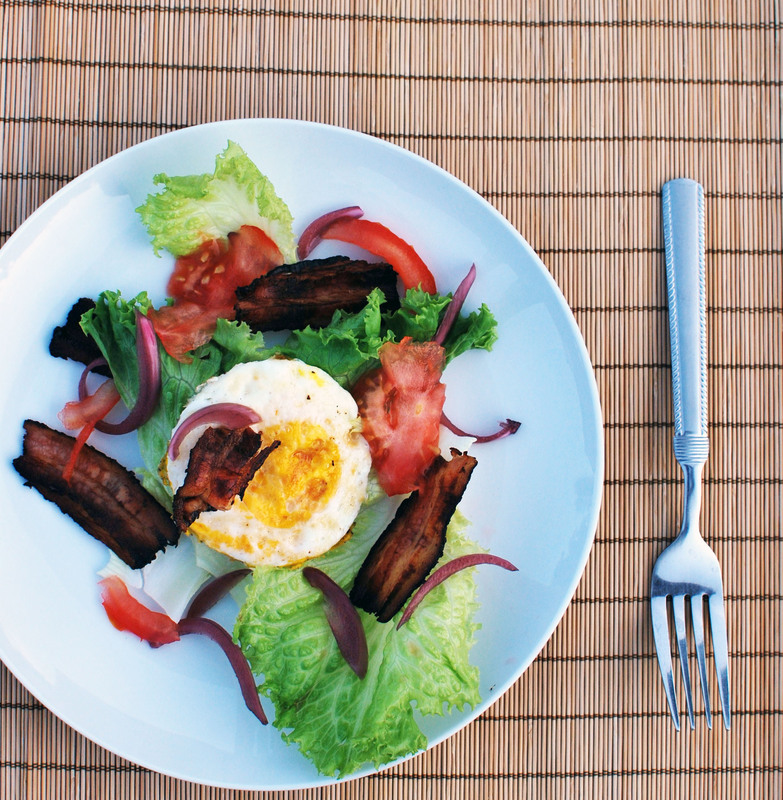 This salad is just one example – sweet, smoky, crispy bacon over a salad of local lettuce, fresh garden tomatoes, acidic pickled onions, and a luscious fried egg. You don’t have to slave over a stove to get dinner out and this dish is just as good served at room temperature. Sit back, relax, have a drink – and enjoy the beauty of summer. Make the dressing – put the lemon juice in a bowl and whisk in extra virgin olive oil until emulsified. You should have about 3 parts oil to 1 part lemon juice. Season the vinaigrette with salt and pepper. On a plate, put the lettuce down. Scatter the bacon, tomatoes, and pickled onions over the lettuce. Top with the fried egg and drizzle the vinaigrette all around. Season lightly with salt and a few grinds of black pepper. Thank you so much for reading, and let me know what you’d like to see next year! happy anniversary epicurean adventures! it’s been so wonderful to get to know you (+ sample your awesome food). good luck with all the fresh starts + changes coming your way! Happy anniversary friend…cheers to the best d@mn food photographer/writer/recipe maker in all the land! Congrats Vivek! I can’t wait to see what you are cooking next year! Cheers to your first year as a food blogger extraordinaire. I look forward to seeing what you come up with next year!